Sitting in New York City, looking up at the clear June skies, I wonder if I am staring at an endangered phenomena. According to many in the Unmanned Aircraft Systems (UAS) industry, skylines across the country soon will be filled with flying cars, quadcopter deliveries, emergency drones, and other robo-flyers. Moving one step closer to this mechanically-induced hazy future, General Electric (GE) announced last week the launch of AiRXOS, a “next generation unmanned traffic” management system. Managing the National Airspace is already a political football with the Trump Administration proposing privatizing the air-control division of the Federal Aviation Administration (FAA), taking its controller workforce of 15,000 off the government’s books. The White House argues that this would enable the FAA to modernize and adopt “NextGen” technologies to speed commercial air travel. While this budgetary line item is debated in the halls of Congress, one certainty inside the FAA is that the National Airspace (NAS) will have to expand to make room for an increased amount of commercial and recreational traffic, the majority of which will be unmanned. NASA is a key partner in counseling the FAA in integrating commercial UAS into the NAS. Charged with removing the “technical and regulatory barriers that are limiting the ability for civil UAS to fly in the NAS” is Davis Hackenberg of NASA’s Armstrong Flight Research Center. Last year, we invited Hackenberg to present his UAS vision to RobotLabNYC. Hackenberg shared with the packed audience NASA’s multi-layered approach to parsing the skies for a wide-range of aircrafts, including: high altitude long endurance flights, commercial airliners, small recreational craft, quadcopter inspections, drone deliveries and urban aerial transportation. Recently the FAA instituted a new regulation mandating that all aircrafts be equipped with Automatic Dependent Surveillance-Broadcast (ADS-B) systems by January 1, 2020. The FAA calls such equipment “foundational NextGen technology that transforms aircraft surveillance using satellite-based positioning,” essentially connecting human-piloted craft to computers on the ground and, quite possibly, in the sky. Many believe this is a critical step towards delivering on the long-awaited promise of the commercial UAS industry with autonomous beyond visual line of sight flights. Last month, Uber already ambitiously declared at its Elevate Summit that its ride-hail program will begin shuttling humans by 2023. Uber plans to deploy electric vertical take-off and landing (eVTOL) vehicles throughout major metropolitan areas. “Ultimately, where we want to go is about urban mobility and urban transport, and being a solution for the cities in which we operate,” says Uber CEO, Dara Khosrowshahi. Uber has been cited by many civil planners as the primary cause for increased urban congestion. 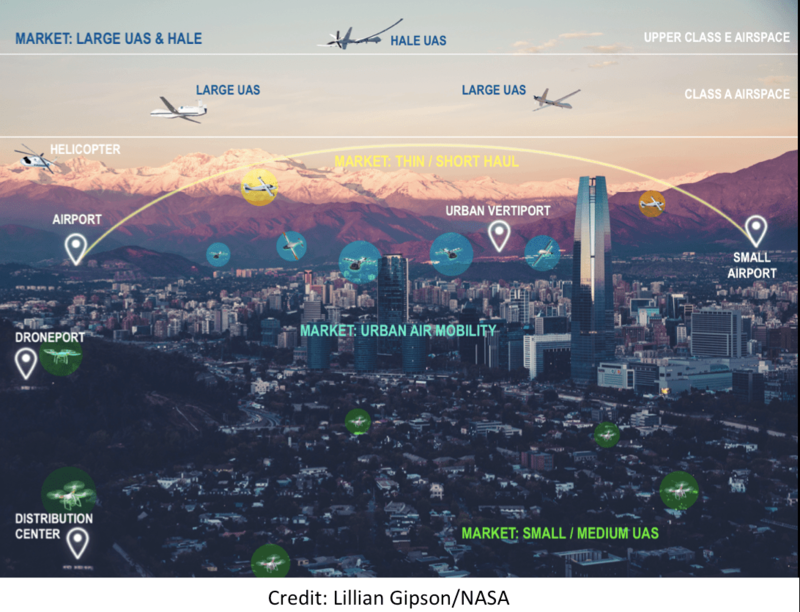 Its eVTOL plan, called uberAIR, is aimed at alleviating terrestrial vehicle traffic by offsetting commutes with autonomous air taxis that are centrally located on rooftops throughout city centers. One of Uber’s first test locations for uberAIR will be Dallas-Fort Worth, Texas. Tom Prevot, Uber’s Director of Engineering for Airspace Systems, describes the company’s effort to design a Dynamic Skylane Networks of virtual lanes for its eVTOLs to travel, “We’re designing our flight paths essentially to stay out of the scheduled air carriers’ flight paths initially. We do want to test some of these concepts of maybe flying in lanes and flying close to each other but in a very safe environment, initially.” To accomplish these objectives, Prevot’s group signed a Space Act Agreement with NASA to determine the requirements for its aerial ride-share network. Using Uber’s data, NASA is already simulating small-passenger flights around the Texas city to identify potential risks to an already crowded airspace. Editor’s Note: This week we will explore regulating unmanned systems further with Democratic Presidential Candidate Andrew Yang and New York State Assemblyman Clyde Vanel at the RobotLab forum on “The Politics Of Automation” in New York City.